Since I’m about to start a new poll I close this one (link to the original post). The result is that 10 people voted and 8 voted yes, dog owners should have a licence, 2 voted against. I read in the South London Press that my friend Peter Richardson is raising the issue of dogfights in parks, this time in his neck of the wood, Manor Park. Well done Peter, we must tackle this scourge and keep on raising the issue again until something serious is done about it. A few months ago I drew this little cartoon for the Libdem newsletter Focus as a commentary to an article about the growing population of aggressive and dangerous dogs and the effect that they have on our environment. This is a serious matter that affects everybody and the result of one of the most stupid fashions ever to appear on our streets. Dangerous dogs hardly under control intimidate people and diminish the enjoyment of public spaces, especially parks, and the dogfights that are organized at night in our parks are a cruel and primitive form of entertainment that must be stopped. But I fear that there’s little room for reasoning with the owners of these dogs, these are idiots of the lowest form and quite possibly until licensing is introduced it will be difficult to eradicate this shameful practice. If that was in place unsuitable owners could be detected and prevented from owning dogs unless authorities were satisfied that they were fit for ownership and the dogs were appropriately looked after. I know it’s an unnecessary inconvenient for the overwhelming majority of dog owners that are indeed responsible but the problem is real and is big and there’s nothing in place to stop it. A few months ago I met with the Council officer that deals with dogs to report how the rubber seats of the swings of the playground in the local park had all been chewed up out of shape. What I heard from him is that the current toolkit to deal with this matter is inadequate and that the problem is much bigger than what we normally think. He told me of a figure of 15 dogs a week rescued in Lewisham alone, puppies abandoned because although bred for aggressiveness didn’t come out as aggressive as they were supposed to be and are therefore abandoned. So, let me run the first poll of this blog. What do you think? Should we introduce licensing for dog ownership? 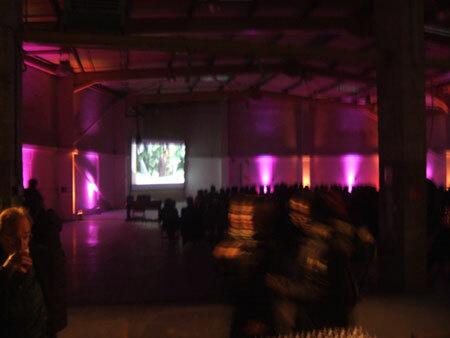 Great thanks to all those who yesterday came to the Hither Green cinema day. – at the final count we broke even which was not something we could take for granted since the operation involved considerable set up costs. Yesterday the newly formed Hither Green Community Hall and Arts Society started its activity with a resounding success, may it continue like this. This blog is back! And this for the reason that at the next elections I’ll be running for Council to represent Lewisham Central , the ward where I live. I will run for the Liberal Democrats and this for a series of reasons, one of these reasons is that the Libdems have a real chance of electoral success and I want to help this change at Town Hall because I believe that this is in the public interest. I remember very clearly the first time I thought that maybe I should run for Council, I was at Town Hall at an Overview and Scrutiny Business Panel committee meeting, it was 29th May 2007. The issue was that the Mayor had taken a decision without giving a motivation, be it either officer’s advice or his personal take. Some committee members wanted to ask the Mayor a written motivation, just so that we know why, fair enough one would think, after all he’s an elected representative with executive powers and that’s a scrutiny committee purposely set up by the Constitution to check on what he decides. Only that the leading Labour member Cllr Alan Hall thought differently and there and then did something quite extraordinary. He questioned a high ranking officer there present about the Mayor’s capability of understanding issues. Basically, he asked for a character reference. I could not believe what I was hearing and seeing. The officer replied that the Mayor always showed a sharp mind and a clear capacity of understanding the subjects put in front of him (he could have said differently if he wanted to put his job on the line of course). At that point Cllr Alan Hall asked the committee a vote to decide to move on to the next subject as the character reference they had just heard was enough to satisfy the necessities of Overview and Scrutiny over the Mayor’s decisions. According to his reasoning the mere fact that the Mayor had taken a decision meant that a good decision had been taken. Cllr Hall’s motion was seconded and all the Labour members voted in favour, they were the majority of the members present (the conservative member didn’t attend) and so the motion was approved. That decision of the Mayor remains unexplained. (Here are the minutes of that meeting. The juicy detail of the character reference is missing but besides that the event is on record). Can we have more of this? Can we have a Mayor taking decisions without explaining why and a Leader of the Labour group that thinks that it’s his job to protect the Mayor from scrutiny even at the cost of setting up undignified pantomimes like that of the character reference to ascertain the Mayor’s capacity to understand issues? Of course we can’t. The way Lewisham Council is run is in many ways a farce, it wants to be unaccountable and so it’s secretive, this means that when it’s misguided it goes unchallenged. The result is that many times it spends much time and huge sums going back on bad decisions that lead nowhere. Look at the new school, it’s seven years that they started building it and there still isn’t one brick over another. If I had not experienced this and felt something needed to be done about it I would not run for Council. If I had confidence that the Labour group can deliver the goods in the future I would not run for Council. If I didn’t think that things can be changed through the democratic process I would not run for Council either. If I knew of a better way to change things I would go for the better way but I am convinced that at this moment in time the most useful thing I can do for my community is to run for elections and help the Libdems to gain control. 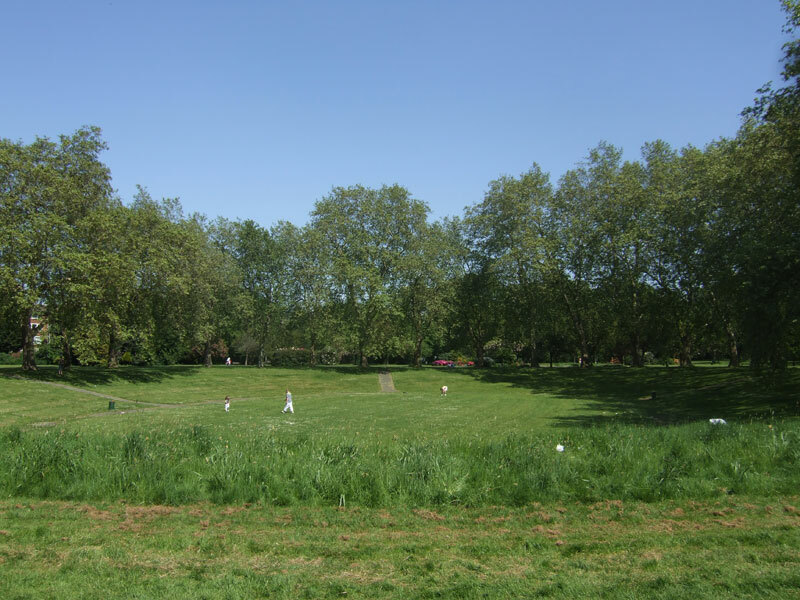 At the 2006 elections with the Save Ladywell Pool campaign we moved public opinion to the point where the overwhelming Labour majority of 45 out of 54 Councillors was reduced to 26 out of 54, bringing for the first time in decades a degree of scrutiny and competition back to the Town Hall. That time I was convinced that the best way I could serve my community was to clearly spell out my experience of the arrogance and incoherence of Lewisham Council. A leaflet with my personal appeal to Labour voters to switch to whoever they wanted but to stop voting Labour was delivered to 30,000 Lewisham homes in walking distance of the pool. Many took my advice and the Council became a better Council, but the seeds of destructions are there. I have no confidence that Lewisham’s Labour leadership will behave democratically if they gained back full control of the Council. Look at what happened at that committee when Labour, by virtue of an absent Conservative Councillor, had the majority. They used it to keep a lid on the way they run things. There are also good people in the Labour group of course, but by what I know and could observe they’re either not particularly influential within the Labour Group or on their way out altogether. In my experience those in charge today should not be Lewisham’s future. I like the Libdem group. Cllr Andrew Milton was my first contact and I am very proud of being his friend, he’s the embodiment of British fairness and I always thought that he would be a great Mayor, unfortunately he really doesn’t want that job. Cllr Chris Maines, the Libdem candidate for Mayor is also a very fair and highly intelligent man and one that is genuinely interested in the issues that affect people’s lives. He’s not a supporter of the Mayoral system as it is now and he would run the Borough with a very different style than Sir Bullock does. This Mayoral system is in big need of reform and there could be constitutional changes to make it fairer and more efficient, where efficiency is not the measure of the speed of bad decisions as they flash in front of the Council the moment before they are approved by the Mayor, but a set up that allows the Council to effectively help the decision making process by reviewing the work of the officers. In the meantime, waiting for Constitutional reform, we can have a different personality at the helm. We need a Mayor that respects the Council to the point it actively seeks its collaboration and we also need a Council of quality to assist the Mayor. We need a majority group at Council that debates openly and is not afraid of going off message if that’s what’s needed to take the best decision. We need group dynamics that don’t make people afraid of being critical but that make different opinions accepted as positive elements of the debate. We need a group that respects the community it serves, not one that promotes insulting bogus consultations that have no purpose other than pretending that the Council “listens”. We’re so lucky we have a democracy, we need to use it and make it work to its full potential and on that front there’s a long way to go from where we are now. There are big issues to decide on and we need a much more open way to run this Borough that what I think the current administration is capable of. Today I was out leafleting with Cllr Duwaine Brooks, he’s got a big history and has also a history of high profile campaigning against violent crime. He was elected Councillor for Downham in a by-election in January and is now group leader at the Safer Communities Board of the Local Government Association. You would think that he’d be seen as a great asset at Lewisham Council. The truth is that he has to ask repeatedly for the papers on community safety in order to know what’s going on. He takes no nonsense and is not afraid of challenging officers and only because of this he is effective. That’s what we need. A fresh start with a new attitude. I want to see him and the rest of the group tested as leading group, running the Borough. And I want to be tested too. That’s why I am running for Council. Walking in an NHS surgery today can seriously entrench one’s position that the world is run by tunnel-visioned zelots. What I’m talking about is the latest feature of NHS surgery reception, the touch screen monitor that people are asked to “touch” to log their arrival ahead of their appointment with the doctor. This task once performed by a human being that would have acted as interface between you and the doctor has now been given to the most inappropriate of means. And I say most inappropriate because although it delivers a measurable budget saving in the form of one job at the desk, is also likely to give a stomach bug to everyone. …or the touch screen monitor at the local surgery I’d add! It is true that people with bugs are advised to stay away from it but will they all? Personally I can’t think of a better way to start a stomach bug pandemic in London. One wonders if the budget gurus of the NHS asked a doctor if they thought this was a good idea. Today I refused to touch it and I had to do some serious waving to get the attention of a member of staff in lieu of the monitor. Fortunately, since I was late for my appointment, I had a good reason to do so, but what if you’re in good time and don’t have an excuse for speaking to a member of staff? Say that you need to wipe the screen before touching! I just called my local surgery to book an appointment, predictably they can’t see me today but what does get on my nerves is that they won’t take an appointment for tomorrow either. I was told that I can book an appointment for next week but if I want it sooner than that then I’ll have to call on the day at 8:00 am and if you have already been subjected to this particular kind of torture you know that by 8:15 all appointments have been booked. This is when the redial button comes into its own, saying that the telephone was busy won’t get you anywhere. The fiddling with numbers goes on. Statistically they will have dealt with a large number of requests within the day, I just hope that the Chair of Primary Care Trust doesn’t get a bonus for this. enough power for 48,000 homes. to play in reducing dependence on fossil fuels. Please notice that this is done to divert waste from landfills in order to help “London boroughs to meet Government and European Directive targets” . …to meet Government and European Directive targets. Unfortunately those Government and European directive targets have also managed to divert from the landfills into the incinerators a few materials that would be much better treated in other ways. What do we do now? Do we need to wait for better Government and European Directive targets to improve our practices? We currently pay vast sums for huge fleets of lorries that constantly crawl our streets collecting our rubbish for incineration. Arguably they carry about one third of excess baggage. It’s all the kitchen waste that should be composted instead of incinerated. Kitchen waste being a very wet material slows down combustion, the result is that much of the very precious by-product of combustion, energy, is lost. If you take the kitchen refuse out of the incinerator you produce more energy and that makes more money. Those money can be invested in better treatment of kitchen waste. And that is also a thing that should be done as near as possible to where it’s been produced in order to minimize transporting it that’s also an activity that’s intrinsically polluting. It’s not meant to sound as a pun but composting can be done at grassroots level. Many people do it in their back gardens and Lewisham is a very green borough with many pockets of land that could be put to good use to compost the waste of those residents that don’t have access to a back garden or are not inclined to compost for any other reason. A whole new economy of small operators could flourish. All paid by the savings on incineration. It could be as small as somebody composting a few of their neighbour’s kitchen waste in their own back garden, or a community group funding some of their activities by taking charge of a block of flats. Maybe I’m going too far, but surely an alternative is possible. I see that in Taiwan they are indeed working in this direction, here’s a paper that makes it very clear and in 2006 Sweden introduced a tax on incineration to encourage recycling and biological treatment. This is a step further than encouraging incineration to reduce landfills. Is it possible to fund an alternative through this route here in the London Borough of Lewisham? I don’t know the answer to that question now, but there are ways to find out. Lewisham Council is one of the partners of SELCHP and I’m thinking of submitting a series of questions around this issue that they should be able to answer. Here’s a first draft of possible questions for the next Full Council meeting (we’re now within deadline to submit for the 29th September meeting so there’s quite some time) and I’d be grateful for any comment that would help define them better (I’d recommend you read about my previous question on kitchen waste in case you haven’t done so already). What is the amount of electricity generated by SELCHP using only waste produced by Lewisham residents and businesses (please specify data for both residential and business use)? Can you also translate this into homes powered so to make an easy comparison with the data advertised by SELCHP that it powers 48,000 homes? How much money does this bring in? What is the efficiency gain that could be achieved if that kitchen waste was not included among the incinerated waste and how would that translate into additional homes powered? Is the SELCHP currently working at full capacity? If part of the load currently incinerated would be diverted towards composting would it be easy to replace it with new customs? On top of the economic issue there is also an holistic one, kitchen waste is alive, it looks just wrong to burn it into ashes when it can regenerate itself into more life, but I believe that if we want to change how things are done the economic argument gives a better guarantee of success. Anyway, to finish this post here’s some basics of composting. We’re 2 days away from next Council meeting and the Council’s website still hasn’t got the questions from the public and the members of last Council meeting held on 30th June. Here’s the link to the page where they should be, on 7th July I even wrote to the web communication team of the Council asking them to put them up and within a fraction of a second I had an automatic thank you reply, still no sign of them though. In the meantime if you’re interested you can download a copy of the members’ questions from me, here, I post them here just to put them on the spot. I had three questions, two on pools and I will write on them separately, one on waste. It may look like an unusual subject for a question at Council from me, the fact is that I was genuinely interested in how the Council deals with waste and also to know something about the recent Brown Bins initiative. Maybe my curiosity was solicited by the fact that quite a lot of those brown bins were assigned to people that have gardens and can therefore compost their own kitchen waste without the help of the Council. What is the cost of incineration of waste produced annually in Lewisham that could be potentially turned into compost instead? Can you also provide me with a detailed breakdown of this cost to be able to understand how much each household of Lewisham as well as commercial activities contribute to this cost? I would also like to have the data broken down between houses with use of a garden and those without. Can you also provide some data about the pilot brown bins initiative? I’m interested in its cost and the volume collected and how it has been disposed. I would also like to know how many households with brown bins have a garden. Lewisham is in the process of undertaking a waste compositional analysis of its waste and from the reports that have been received to date approximately 35% of domestic refuse could potentially be composted at home. This includes kitchen waste and garden waste. In terms of tonnage, Lewisham incinerated 76,093.37 tonnes of domestic waste in 2007/8. Based on the waste compositional analysis 35% or 26,633 tonnes of this could be home composted. Lewisham pays a set price per tonne (gate fee) to the SELCHP incinerator and the cost of the gate fee for 35% of waste was £1,211,268 for 2007/8. Lewisham Council has to report on the costs of waste collection and waste disposal. The cost to the Council for waste collection per household is £51.31 and the costs for waste disposal are calculated per tonne at £47.01. However, it must be noted that this is not the cost that householders pay through their Council Tax. The Council Tax only contributes a small percentage of waste costs, the rest of which comes from Central Government through the Revenue Support Grant. The data for this is not broken down for households with gardens and those without. Businesses on the other hand do pay for their waste collection and disposal services and this amount depends on the amount of waste that they produce a week. The trial garden waste service took place from July to October 2007 across approximately 5,000 properties. The areas that the trial took place in were chosen as they had a high proportion of properties with gardens. The costs for running the garden waste pilot were approximately £180,000. The green waste that was collected from the properties on the green waste pilot was taken to Country Style Group via Veolia Environmental Services. This was then composted using a windrow composting system and the resulting compost used in agriculture and landscaping. What I find most of interest is that the incinerator charges a flat fee, no matter if it is a ton of dry wood or a ton of soggy rotten potato peels. Obviously a ton of dry wood will produce energy that the incinerator then sells on as electricity, the ton of soggy rotten potato peels will instead require additional energy into the system to be burnt. Soggy rotten potato peels make wonderful compost at no cost but another interesting point that one evinces from this answer is that it’s so dirty cheap for Lewisham Council to incinerate that economic reasons will never be a push towards composting. With those figures I pay for collection and disposal of all my rubbish with less than 3 weeks of Council tax a year. A bargain. The Brown Bin trial came at a cost of £108 per household per year and that’s only for the collection, the total for collection and disposal of the same stuff plus all the other non recyclable rubbish comes at £98.31. What we don’t know from this answer is if the Council disposes of the compostable at any cost or if it even makes some money out of it but even if that would be the case I think that it would be a rather small sum given the extremely low grade nature of the traded. Last year the Council paid £1,211,268 for the incineration of the potentially compostable material. I think that there are about 110,000 households in Lewisham, that makes it about £11 per houshold. That’s about two days of my Council tax. But as they say it’s not even paid by the Council tax, it’s mostly out of grants that the Council receives so they have even less of an economic reason to shift. It may be that unless the incinerator starts charging according to combustibility there won’t be any significant shift towards mass composting and we’ll keep on burning soggy rotten potato peels at huge environmental cost for another while. I’m again in the local news, standing up for swimmers! The Mercury quoted me, the News Shopper called me a furious swimmer. I really like that. And nearly furious I was two days ago at Downham Pool where at 9:40 pm, 20 minutes before end of play and just as I was getting into the rhythm two lifeguards started winding up the lane floats . Standing up mid pool and pointing at my wrist I yelled them a loud and clear “Oi!”. The lifeguard looked very puzzled, then lifting his hands half-way up he walked back and put the floats that he had just released back into place. Two swimmers nodded at me in approval and went back into swimming their lengths, their lanes still there. Council must take the blame and somebody must go! Just a few thoughts about the Legionella bacteria at the pool. First of all, let’s keep fingers crossed that nobody gets affected by Legionnaire, I know a battallion of pensioners using the pool and I want them to keep well. Second thought, since the bacteria was there it’s only a matter of luck if nobody have contracted the disease. But the responsibility remains, the Council have put people’s lives at risk through neglect. I don’t think that it’s over the top to ask Cllr Chris Best to resign from her position as Cabinet Member for Community. This may sound hard on her but it’s the place that she occupies in the administration that has the responsibility for the upkeep of Leisure Centres as well as the formulation and implementation of adequate policies reguarding Health and Safety in public places. ladywell baths are dirty and in need to of a clean . It is a disgrace the this service has been neglected to the extent that is appears to be a health hazard . Complaints like these have also been received by the Council and the contractors for years, this is no news, this is what people have been saying for years, and what has the Council done? Nothing. I can even remember the Mayor axing the repair and maintenance budget for the pool one year, and with gusto! Now, I here said that Cllr Best should go, but of course in an Executive Mayor system as in Lewisham there’s only one person that carries responsibilities, it’s the Mayor. But he never takes a blame, doesn’t he? I don’t want to waste my time asking him to go, he won’t, that’s why I’m saying that it’s the Cabinet Member for Community that has to go, it’s the only way that this administration can pursue to show us that they understand the gravity of their neglectful conduct. Ladywell Leisure Centre was closed yesterday afternoon and will stay so until further notice. I sent an email to the officer in charge of the Pool and am waiting response that will post on the best available place on the net as soon as I receive it. I would have written all this at http://www.saveladywellpool.com but it is rather down at present. 1:00 pm Dramatic Update!! We were misinformed, it’s not that the toilets are out of order, it’s legionnaires disease bacteria in the showers! The News Shopper has the story, click here. What about open air theatre? 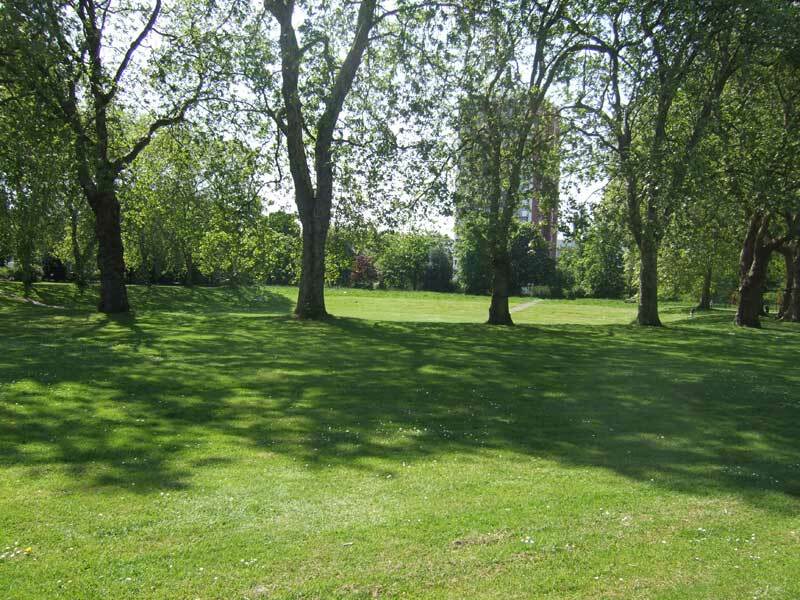 There is a wonderful spot of Lewisham Park, a gem in the city, it’s a lawn, in a depression of the ground, surrounded by tall trees. Here’s two pictures that I took a couple of weeks ago, the top one shows the area as you see it through the trees – the drop just after the trees is of about 3m, gentle slope but clearly delineated. The second photo is of course taken from the other side. 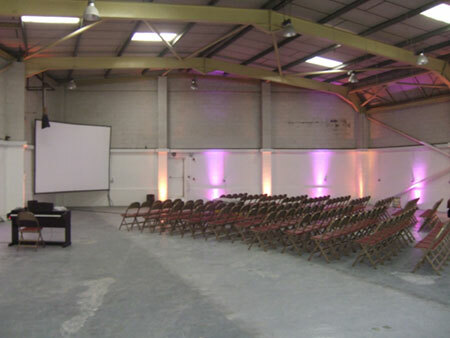 To me this looks like a theatre and to be one it only needs a stage. And some performances of course. And as I thought this I started thinking that one could have all the local children attending and learning performing arts, such an accessible space. I see that Lewisham Council is now asking for ideas on how to spend money on “play areas for children and young people” and it also says that “play can also act as a gateway to structured, positive activities” and also “support services for children and families who may be hard to reach through other routes”. Well, a good way to do this would surely be to place a stage next to a traditional playground, so that children and their families can do exactly what the Council wants them ultimately to do, “structured, positive activities”. And many of the families there fall exactly in the “hard to reach” category, as the Council jargon identifies them. The Play area in that park is pretty bare, it would surely do with some money, why not also complement it with a performing arts area for daylight activities during the long days of summer? I was preparing this proposal with the intent of bidding for some of the locality funds at the next Lewisham Central Assembly on 21st July and I also had in mind to contact the housing association London and Quadrant for some matching funds as they have at least 192 tenants overlooking the park since they now own the three big blocks by the park. But now that the Council is asking for ideas to help them spend £1m I’ll try that first. The proposal doesn’t stop at building a stage, the stage is only the focal point, it’s supposed to host activities, what one then needs is some sort of residents’ association to build a program and involve the target audience. Add to it that looking at the Calendar one gathers that yesterday’s Mayor and Cabinet meeting was cancelled and it really starts looking like “a regime run by officers” (words of a Labour Councillor, not mine). Today’s big story is that I’ve been shaking hands with the Mayor of Lewisham Sir Steve Bullock. But don’t believe that I’ve softened, I even have a submitted question in for next Council meeting. 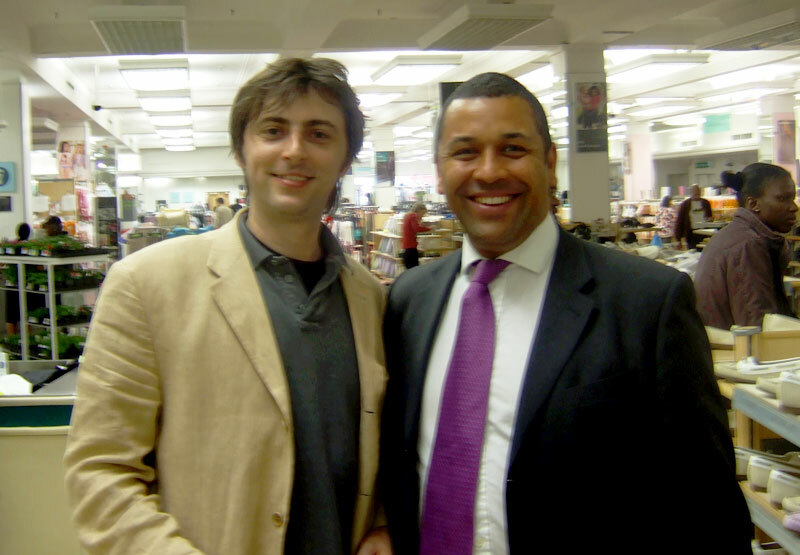 What better day to bump into James than on his first day as Member of the London Assembly, a Tory in a Tory administration of London, he was still on a cloud trying to grasp the full extent of what his election entails when I met him yesterday at Marks and Spencers here in Lewisham. I feel I don’t have anything to add to the comments on this last local elections, the blames, the fortunes or misfortunes of one or the other party, everybody seem to be saying the same thing and they all seem to be pretty spot on but one thing that I’m truly happy that this election brought us is the election of James Cleverly as member of the London Assembly. Having known him for a while I know what a nice guy he is and how seriously he takes politics. The fact that I am not a Tory will tell you how truly heartfelt this congratulation is meant to sound. Electoral success has been elusive to him until now, but what better way to break the tradition than to get on one of those real jobs that politics offers, helping the new Mayor of London to decide how to work for the good of London. Good on you James. Also congratulations to our other local boy on the assembly, Darren Johnson has been re-elected as one of two Green Party members, he’ll make sure that the Tory slogans on blue being a new green stands to some scrutiny and if you know Darren you know how much a master of the art of politics he is, he might be in opposition but he surely knows how to put up a fight from there. There’ll be Johnson vs. Johnson soon at the Town Hall and that will be serious fun. 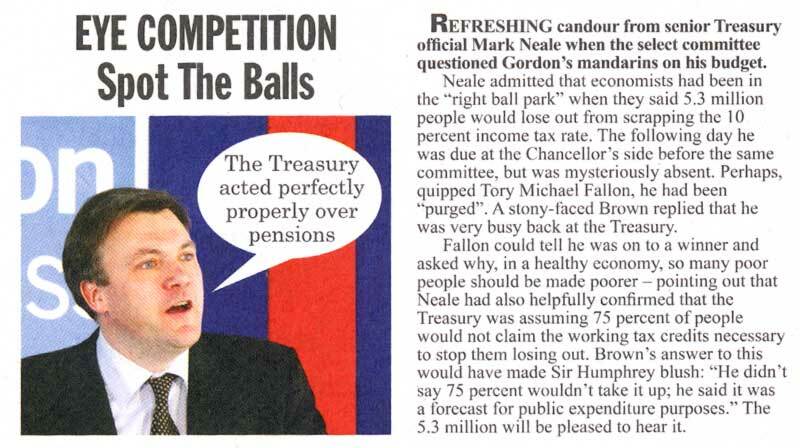 …last year Private Eye published this very interesting little report (click on image to enlarge it). Apparently, only one year later, the Labour Group at Westminster managed to read it. If yours is a Labour MP do yourself a favor, buy him/her a subscription to Private Eye. The other day, as I was walking through the Dressington Avenue side of Ladywell Fields, I saw an old gentleman sawing branches off an oak. As I went closer I noticed that the branches that he was sawing off had all been damaged by the bites of some of those Pitbulls that are often seen being encouraged to jump and chew up by their not-too-clever dog-owners. Two things that I didn’t know are that trees get infected through the wounds that they receive from the bites and that dogs get infected through splinters in their gums and that’s why there are those rubber balls for dogs to chew (he also had a dog). So, when the old man became tired of sawing I volunteered to help in, I was then passed the cross saw and had my first sweet taste of guerilla gardening. Thanks to Cllr Andrew Milton I was a guest at Lewisham Council’s AGM on Wednesday and proud I stand to be a friend of his because I think that he was the only humble opposition Councillor that the Mayor mentioned during his speech. As it was probably meant to be a rebuke then it was an acknowledgment of his effective role in opposition. In the past I twice had the honor of a mention during the Mayor speech at AGM. Not that my name was pronounced, only strongly alluded to. This year I materialized. Leaving the Council chamber for the refreshments I found myself heading straight into Mayor Sir Bullock himself, me and him, the first two people to reach the buffet table and nobody else in the room apart from the waiters, a potentially very awkward situation but somehow we managed, I grabbed a glass of white, he opted for a beer, we started to exchange a few words, cordially enough I think. As we chatted, the room started to fill up, so off we went, we both had a lot of people to talk to and personally I had quite a ball. Last week, as I sat in front of the television to see me interviewed on BBC London News I didn’t know what to expect. Not that I didn’t remember what I had said, only that I had said quite a lot of things, and as television times are notoriously short with all probability much of what was recorded would not have made it through the editing. But that was clear from start. In fact when the BBC journalist Matthew Cooke called me asking me to interview me about Forest Hill Pools I didn’t agree to that, but as we chatted about the recent events surrounding swimming pools in Lewisham and I told him that Forest Hill Pools was only one of two “shells” of Victorian Pools in Lewisham, both opened to the public within the same two weeks in 1885, both in an awful state of disrepair, an idea for an interview with a different slant came up. So we recorded this interview in the alleyway between Ladywell Road and Lewisham High Street, me pointing at back of the derelict Victorian Ladywell Pools. There I spoke for a few minutes touching on various issues around swimming pools and historic pools. an investment in swimming pools would reflect positively on the budget for the NHS and to fail to see this shows extreme short-sightedness. With all this to say I didn’t want to be boxed into something that I am not, I was also aware that many people in Forest Hill just want the old pool to be taken out of its misery. If the Council can’t keep it in good order than maybe it’s better to knock it down and build a modern one. I find it impossible to disagree with that. In a different situation I probably would have stood for old Forest Hill Pools, in fact if the Friends of Forest Hill Pools would not have fought along many years to keep the old one up, today there wouldn’t be a pool to speak of there. The pools were first saved from closure some 12 years ago, and in case somebody forgot only three years ago the Mayor approved a consultant’s report advising him to keep only 4 pools in the Borough, and Forest Hill was not one of them. The fact that the pools will now be replaced is an achievement of those efforts, sad to see that something that is a bit smaller is what’s on offer but at least there’s something on offer. Going back to the interview. I think that the peculiar characteristic of it was that unlike my past media passages this time I wasn’t campaigning for anything specific, I didn’t have to push one message through, so I was particularly relaxed, I had a quite clear idea of what I wanted to say but not a prepared speech, just an ad lib improvisation on someting I’ve come to know quite well. I was really more interested in giving the image of the two Victorian pools and their parallel lives and dismissals, I find that quite poetic, unfortunately news editors are more interested in a quick point. Never mind, I was aware that my poetic image probably would not have made it entirely so a few quick points to choose from were provided, one made it into the news and I’m quite happy with it. How many PFI consultants to change a lightbulb? I haven’t posted anything on this blog for a while for the simple reason that I’ve been very busy with real life but I have just read this little news on the local newspaper and as I realized that it’s a unique opportunity to write this title I decided to break the silence. Bright future for streets thanks to cash boost is about the privatisation (pfisation?) of the street lighting maintenance services for Lewisham and Croydon through a joint contract with some company still to be appointed (but that we can imagine is already in negotiation). The figure that the newspaper gives is for a £ 79.5 m contract to change 44,000 lights over 25 years and if my calculator works correctly this means that the changing of each streetlight comes at a cost of £ 1,806 and that on average each one of the two Boroughs will have 2.4 lights upgraded (changed) every day. You can also read it as a £ 1.59 m yearly budget to change the lights in one borough, not little money I dare say, I checked on the Council’s budget and this year there’s £ 410 k for the job. Government transport minister Rosie Winterton said: “Experience shows better street lighting helps improve road safety and reduce crime and the fear of crime. I just wonder if transport minister Rosie Winterton has any idea whether these fundings for street lighting coming from her department are well spent by employing a private company to change lightbulbs for 25 years and if they will they do a much better job than the Council would do with the same sum? I suppose that this press release was a good opportunity to tell us, and now a missed one. What’s quite ridiculous about this pfisation of everything is that it is an implicit admission of being unable to do all the jobs that they were supposed to be doing and I am the first to agree with it, the street lamp outside my house is a vision to behold, until a few weeks ago, apart from the characteristic peeling and rust, it used to be a nice Victorian-style post, then one day a man from the Council came round here and sawed off the top of it to replaced it with a plastic football-field-like light transforming it into a two-style monster. I challenged him and told him that it was ugly, “it’s an upgrade” he replied*. Will the private-men upgrade lights better than the Council would do with those money? Well, not necessarily, first consideration that I would make is that a 25 years contract shelters you from any competitive pressure, and that’s one reason for private sector instead of public that goes out of the window, another consideration is that the contractors will still be accountable to the same people that are now sending us these current upgrades so maybe it’s them that need an upgrade first. Anyway, since it’s a unique opportunity I want to repeat the original question, how many pfi consultants do you need to change a light bulb? This is not a silly question, every time that there’s a pfi contract millions are spent on negotiations, with a £ 79.5 m contract at stake you can imagine that negotiations will be serious and quite a lot of tax money will go to solicitors and accountants (tax money heaven). * it’s dark now, tomorrow I take a picture of the awful lamp post and post it here for you. Posted in locals, Personal Politics, small talk | Comments Off on How many PFI consultants to change a lightbulb? I should write something about the end of the fight to get the Council to act decently around the planned replacement for Ladywell Pool. I’m still trying to get my head around that but it’s a very complex issue, many people involved, many surprising behaviours and I don’t want to write things I may regret to. 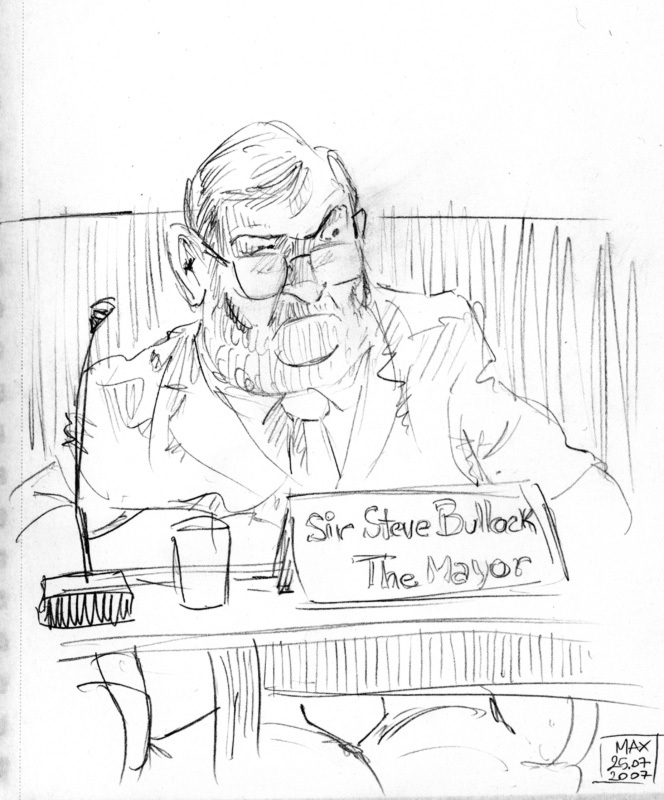 As usual a picture speaks better than a thousand words, here’s a little sketch of the Mayor as I saw him at the Mayor and cabinet meeting where he put the final nail on Ladywell Pool.